I happened to think of this after hearing about Sean Waltman coming back into town for a show at First Ave on 6/19. Back in the early 2000’s there was a local independent wrestler from the Hibbing area named Jeremy Halberg. 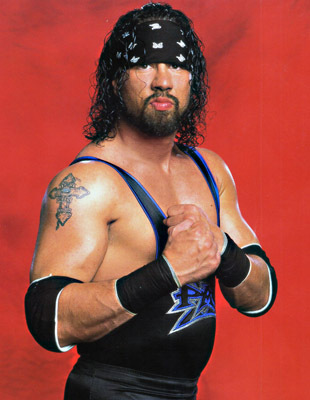 I can’t say that Jeremy’s gimmick was the same as Waltman’s X-Pac gimmick, but the look was almost identical. Same long dark hair, similar beard, same dark blue or black headband, same sunglasses, same leather jacket, etc. You can find a couple of pictures of Halberg in his gear on an outdated website that was from before he started taking bookings in the area. Over the next year or two, Halberg was getting a lot of bookings down here, so I would see him a lot at the shows. He generally came into the building looking close to what he wore in the ring (headband, sunglasses, etc.). At one afternoon show at the Main Event sports bar (one of my all-time favorite places), I was standing outside the service entrance in the back of the building with another worker (can’t remember who offhand, let’s just say it was Thor Tyler to give him a plug). All the boys usually came in the back way whether you were working on the show or just visiting. The “locker room” was back in a storage area next to the walk-in cooler. A few minutes later a car pulls up, “Halberg” gets out, and walks up to us on his way in the building. “Hi guys,” he said to us. “Hey, how’s it going man? Good seeing you again“, I said. Thor just had his mouth open- I don’t think he said anything. “Halberg” then walked into the building. “Holy Sh*t! Do you know who that was?“, Thor said to me. “Yeah… that was Halberg“, I said. “No way, that was Sean Waltman“, he said. I started laughing hard and could barely catch my breath. “No it wasn’t. It was Jeremy Halberg. He works the shows down here a lot.“, I said. “He looked exactly like Waltman“, he said. “I know. They’re pretty close. But Waltman isn’t as tall as Halberg is. And if he wasn’t wearing those shades you’d be able to tell right away.“, I said. “Are you sure?“, he said. “Yes I’m sure. He just dresses the same. What would Waltman be doing here?”, I said. “He was trained by Sharkey“, he said. “Yeah… you think the Road Warriors are going to show up next?“, I said, laughing again. “And besides, you can’t just “mark out” and yell Holy Sh*t everytime you see someone famous“, I said. “That was definitely Halberg. Come on, I’ll prove it to you.“, I said as we walked back into the building. As my eyes adjusted to the darkness, I saw “Halberg” standing next to Eddie Sharkey. He had his sunglasses off, and I could now see clearly that it was not Jeremy Halberg at all. It was THE Sean Waltman. Sean “Lightning Kid” “1-2-3 Kid” “X-Pac” “Syxx-Pac” “Syxx” Waltman. “Holy Sh*t! That is Waltman!“, I said. “I said ‘Good seeing you again?’ to him. He must have thought ‘Who’s this clown?- I never met this guy before’.“, I said. I don’t know why I was so surprised, since Curt Hennig, Nick Bockwinkle, and many other famous names had shown up at this particular location over the years for wrestling events. Every time I saw Halberg (the “real” Halberg) after that, I always paused a few seconds and sized him up before saying anything. I’m still not sure who’s taller. Below are links to some wrestling-related blog entries & articles that I found interesting during the month of May 2009. Rantables: A Character Shattered. I have similar feelings about hearing Umaga speak perfect English on Smackdown. [Insert Meaningful Title Here]: Current Situation in the World of Fake Violence. He used the “F” word (fake), but I’m still linking anyway ;-). Echoes some of my previous rants (here, here, and here) about not pushing younger stars. Wayne McCarty: F1rst Wrestling: The Return 09. Jerry Lynn vs. Sean “Lightning Kid” “XPac” Waltman on June 19th, 2009. The Buzz: Great Moment in Pro Wrestling History – Genesis of the nWo. Hulk Hogan turns heel and joins the nWo in 1996. Wrestlegasm: The Dirtiest Job on the Internet… is being a fan blogging about professional wrestling. World Wrestling Fan: Montreal Screwjob. A recounting of the incident in Montreal between Vince McMahon and Bret Hart. The Buzz: Great Moment in Wrestling History — Macho Man Reunites with Miss Elizabeth. Ohhh yeahhh! Heelzone: WWE Releases Mr. Kennedy… Kennedy! Green Bay wrestler Mr. Kennedy (Ken Anderson), who just made his return to TV last week after being out for ten months, gets the axe. WrestleZone claims that the last straw was when he almost reinjured Randy Orton‘s shoulder.